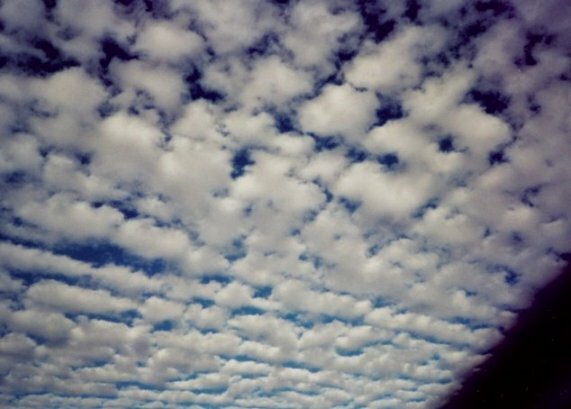 Photo of the Week.. Checkerboard Sky. Astronomy news for the week starting Friday, February 7, 2003. The Moon dominates the evening sky this week, as it changes from a waxing crescent to a waxing gibbous, the transition made at the first quarter, which takes place on Sunday, February 9, the Moon to the west of the classic figure of Taurus. As our companion rumbles along its orbit, it will pass three degrees north of Saturn the night of Tuesday, the 11th, the two making a fine sight in eastern Taurus. As February begins, the ringed planet stands high to the south (for those in mid-northern latitudes) around 8:30 PM, and is now setting in the northwest just as morning twilight begins. Jupiter, some 60 degrees to the east of Saturn, shines among the dim stars of Cancer. Having just passed opposition to the Sun, it rises very close to sunset and crosses the meridian to the south around midnight. Look for the planet low in the east as evening twilight draws to a close. As bright as it is, however, Jupiter pales in comparison to Venus, which hangs brilliantly to the southeast at dawn, with reddish Mars still up and to the right of it above the striking figure of Scorpius. The color contrast between the two planets is readily seen. Though Mars is still moving easterly, they are nevertheless slowly drawing apart, the pair that flank the Earth making planetary motion obvious. Great Orion now dominates the stellar sky, standing imposingly to the south in mid-evening, his three-star Belt (the ancient Arabs' "string of pearls") one of the most striking of celestial asterisms. The red supergiant Betelgeuse is up and to the left, while in contrast the bluish supergiant Rigel is down and to the right. Hanging from the belt is the giant hunter's Sword, which contains the magnificent Orion Nebula. A small telescope, even large binoculars, will show swirls of interstellar gas and dust. Lit by a quartet of extremely young stars in front of it, and some 1500 light years away, the nebula is a blister on the front side of a huge dark dusty cloud in which active star formation is still going on. The bright blue stars of Orion are in fact part of a recognized "association," most of them born from the same complex of parent birth clouds. The figure of Scorpius, opposite Orion in the morning sky, is structured in much the same way. Orion is part of "Gould's Belt," named after B. A. Gould, who noted that many of the sky's bright blue stars fall in a circle tilted to the Milky Way, which runs just to the east of Orion and down through Orion's larger Hunting Dog, Canis Major, the constellation containing the brightest star of the sky, Sirius. Immediately to the east of upper Orion is the Smaller Dog, Canis Minor, with bright Procyon, it, Betelgeuse, and Sirius making the famed Winter Triangle.